Stone Camouflage. The giant has advantage on Dexterity (Stealth) checks made to hide in rocky terrain. Multiattack. The giant makes two greatclub attacks. Greatclub. Melee Weapon Attack: +9 to hit, reach 15 ft., one target. Hit: 19 (3d8 + 6) bludgeoning damage. Rock. Ranged Weapon Attack: +9 to hit, range 60/240 ft., one target. 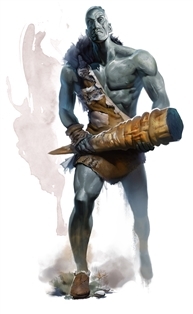 Hit: 28 (4d10 + 6) bludgeoning damage. If the target is a creature, it must succeed on a DC 17 Strength saving throw or be knocked prone. Rock Catching. If a rock or similar object is hurled at the giant, the giant can, with a successful DC 10 Dexterity saving throw, catch the missile and take no bludgeoning damage from it.